This post takes a look at China's claim to the South China Sea and what it teaches us about the whole idea of national humiliation that even foreigners who should know better still use as if it explained something about Chinese government policy. It is actually expansionist propaganda, which presents Chinese expansionism as redress of victimization, as is common among expansionists of all political stripes and nations. 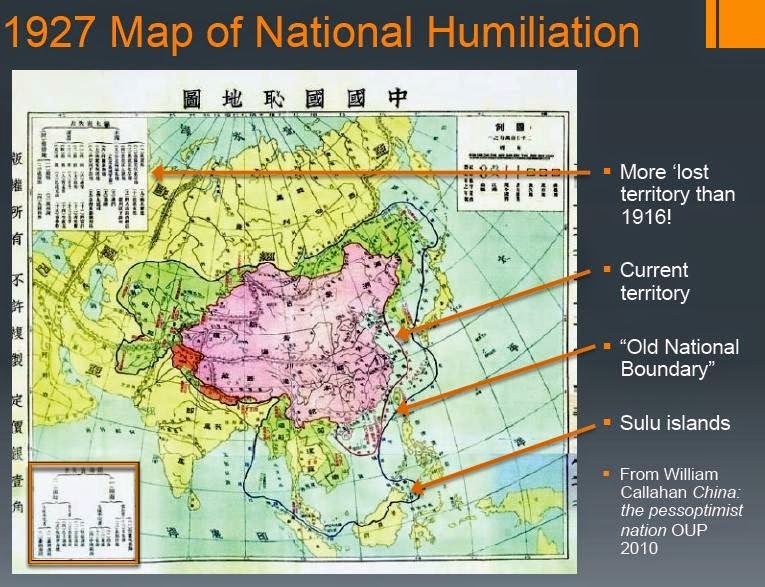 Hayton's presentation gives a background on the whole mess, showing how the SCS claim actually originates in the Maps of National Humiliation that originated as private projects which were eventually taken up by the government. 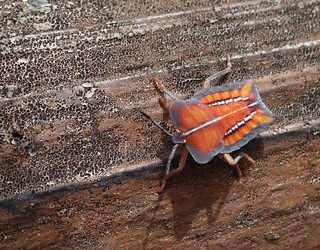 Click on READ MORE to continue to whole (long) post. 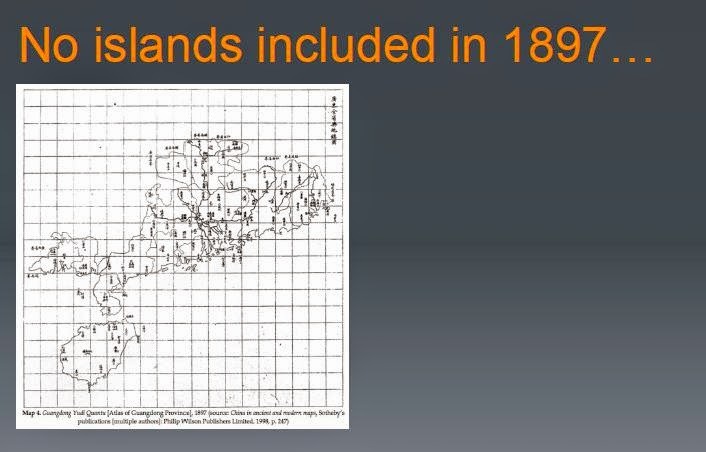 Hayton notes in another piece: "As the French researcher Francois-Xavier Bonnet has shown, a map of Guangdong Province published in 1897 went no further south than Hainan Island." 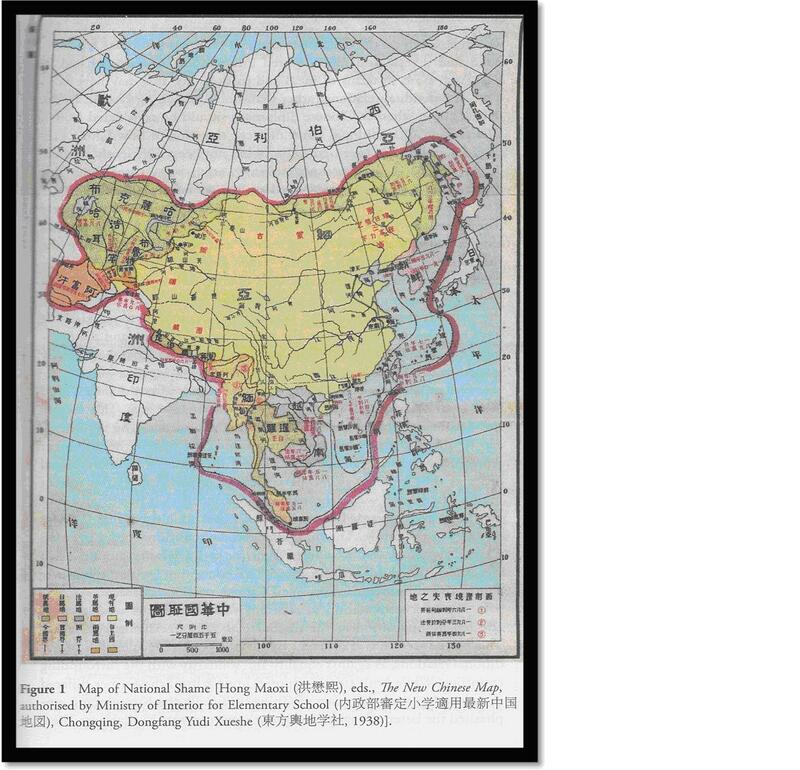 The Philippines collected a large number of historical maps of China for a recent exhibition on its claim to Scarborough Shoal, and in each one going back to the 11th century, Hainan Island is marked as the southernmost point of China, as it is on the Qing map above. The last Chinese dynasty, the Ming, had its borders defined in the Official History (the Ming Shi) written by the Qing and they did not include anything south of Hainan Island. Bonnet's piece in English on Scarborough Shoal is available here. 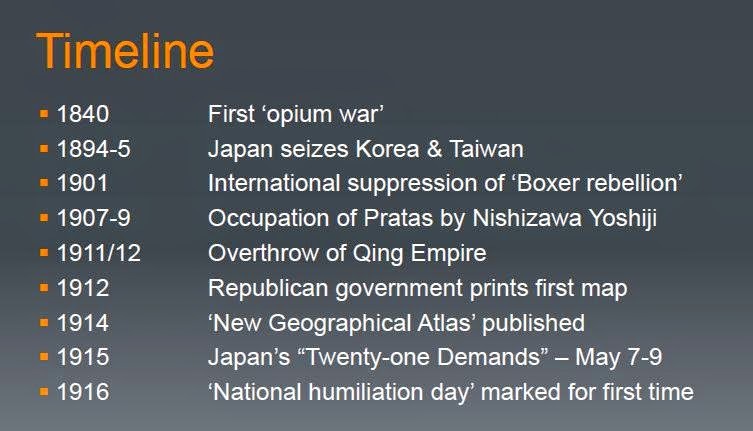 Hayton gives a timeline of the "national humiliation" concept. 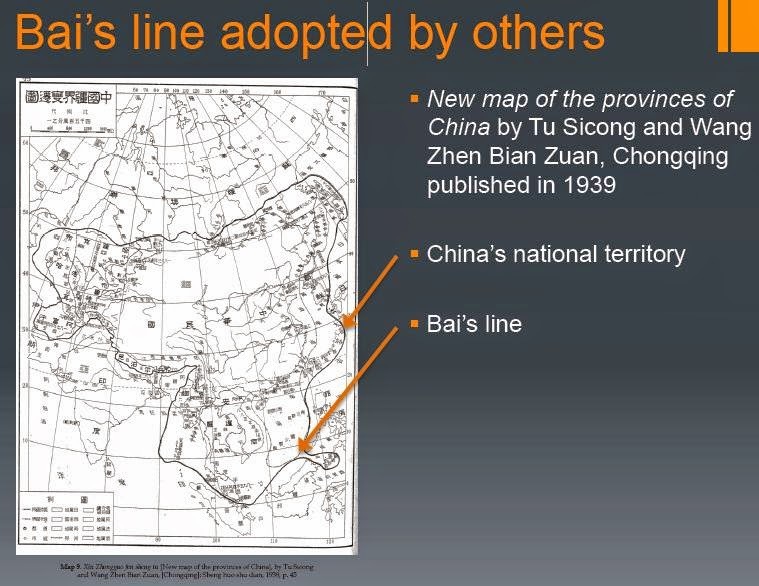 William Callahan's China: the Pessoptimist Nation, has some great data on the development of this concept, and Hayton draws from Callahan throughout this presentation. 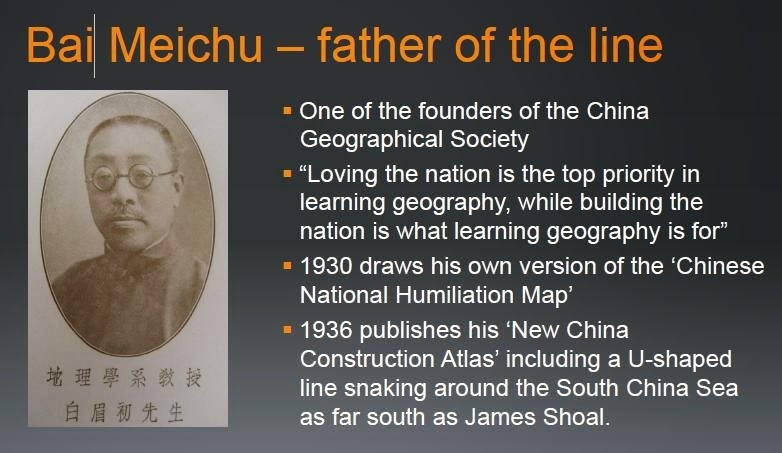 According to Callahan, it was Yuan Shi-kai's acceptance of most of Japan's 21 demands that brought out the first stirrings of "national humiliation" -- a project of private protest against the government's sellout of the nation, led by the National Teacher's Association. This led to the government's adoption of national humiliation as a guiding ideology, with the production of textbooks and historical narratives following as early as July of 1915. After the Nationalists consolidated and asserted their position in 1927, they made May 9 an official "National Humiliation Commemoration Day" and the following year put out a calendar with 26 National Humiliation Days in a given year. That's a lot of humiliation, but to convince the population of a large empire that it is the victim of history rather than a victimizer takes a lot of propaganda. Callahan observes that the 1928 calendar incorporated local national humiliation days to reach that total of 26 -- the usual Leninist practice of incorporation rather than extirpation. The May 9th commemoration of National Humiliation Day ended in 1937 with the Japanese invasion and the establishment of July 7 as National Resistance Day. Callahan notes that today the purpose of "national humiliation" is to contain and channel nationalism so it does not threaten the CCP's grip on Chinese society, and Chinese experience "national humiliation" via consumption of national humiliation goods just as consumers in western societies recreate their social identities via consumption -- my favorite good being the National Humiliation towel, good for washing your face and washing away humiliation at the same time. A provincial Chinese delegation had reached the Paracels a few decades earlier, on 6th June 1909, making what appears to have been a one-day expedition, guided by German captains borrowed from the trading firm Carlowitz. On such humble claims rests international confrontations. The reason they had to borrow German captains is because there were no Chinese pilots capable of taking them to the Paracels, he says. 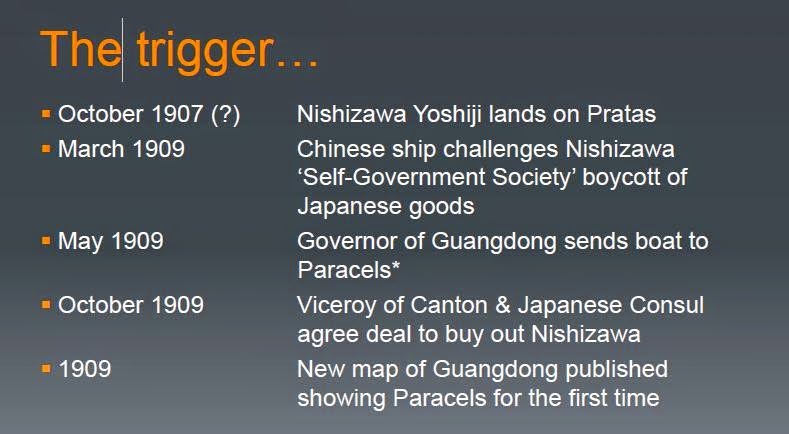 Finally, in 1909 the Paracels appear on a Qing map for the first time, the first time any government of China had shown any interest in them. 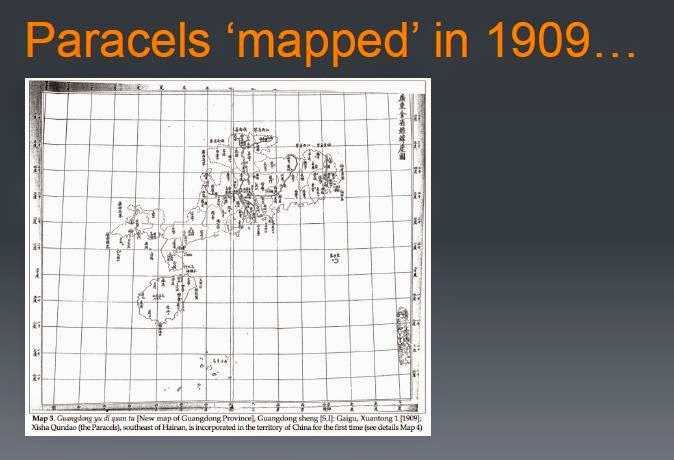 This 1914 map shows how history is falsely distorted to create modern legitimacy. It shamelessly lies about the extent of Qing control to legitimate its claims by locating them in the past. This 1927 map goes nuts and once more illustrates how "humiliation" is actually an expansionist ideal repackaged as redressing victimization. 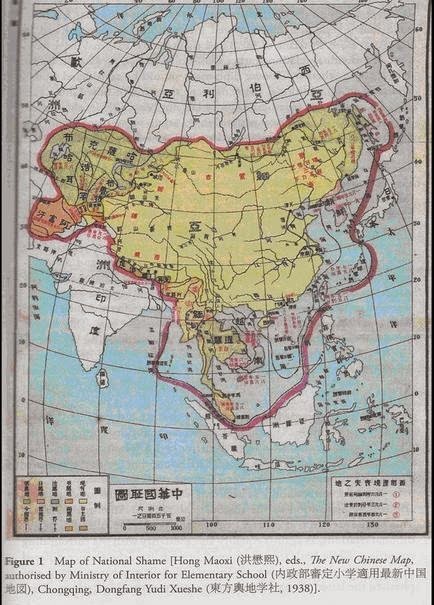 Note the vastness claimed by China on the western side of this map, as well as the claim to what is now peninsular Malaysia and north Borneo. And the Sulu Islands. Note also that "current territory" does not include any islands south of the Paracels. I've located some other fantasies of expansion like this on the intertubes. This one is a 1938 government authorized elementary school map. These maps draw on false ideas about the way the tribute system worked to recreate a fantasy China that actually owned the nations that sent "tribute." Here note that Laos, Cambodia, Korea, and Vietnam are "lost territories" awaiting "reunification." This blogpost has a bunch of such maps. If you search this text string 國恥地圖 in Chinese you can find many. 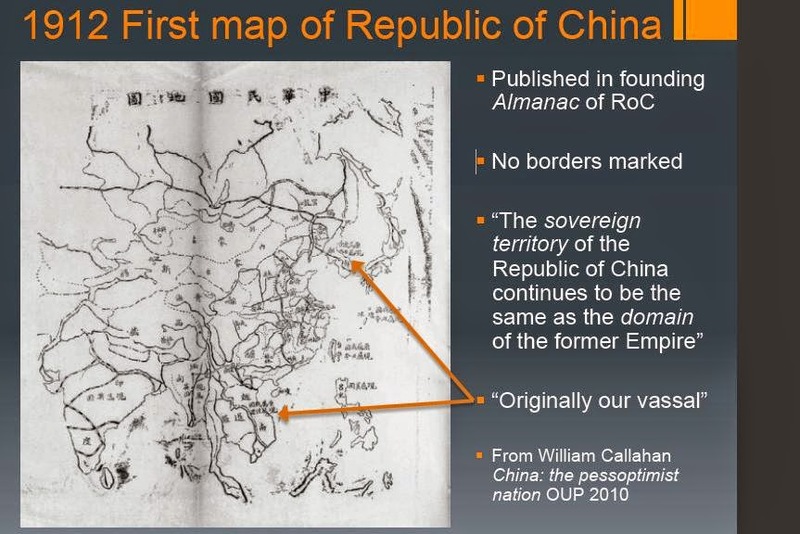 Thus, as several academics have pointed out (for a good discussion, see the end of Emma Teng's Taiwan's Imagined Geography), under the rubric of humiliation/expansion, Qing expansion becomes "unification of the nation" and any discourse on Qing imperialism disappears. Since there is no Qing imperialism, studies of Qing expansion in China are called "frontier studies" there. As Teng observes, another fallout of this ideological stance is homogenization of local identities into Beijing's constructed Chinese identity, since all this vast diversity of peoples and cultures under Beijing's sway is swallowed up in the construct "Chinese". 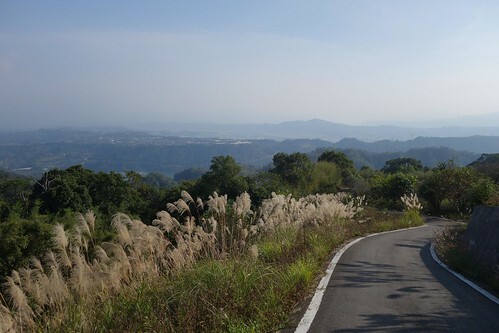 This long historical process of assimilation and destruction of local difference wrought by the CCP and ROC before it, is taking place within China's borders as well as driving the protests in Hong Kong and the rejection of Beijing's imperialism in Taiwan. We just notice it less where it stamps out the scores of ethnicities in China and replaces them with Beijing's imperial construct, because those acts take place deep in China, far from western eyes. The 1930s were the decade in which China really began to awaken to what it could grab. According to Hayton, French activity in the Spratlys got the Chinese all hot and bothered, and they set out to occupy the islands. No Chinese official would set foot on the Spratlys until 1946, he observes. 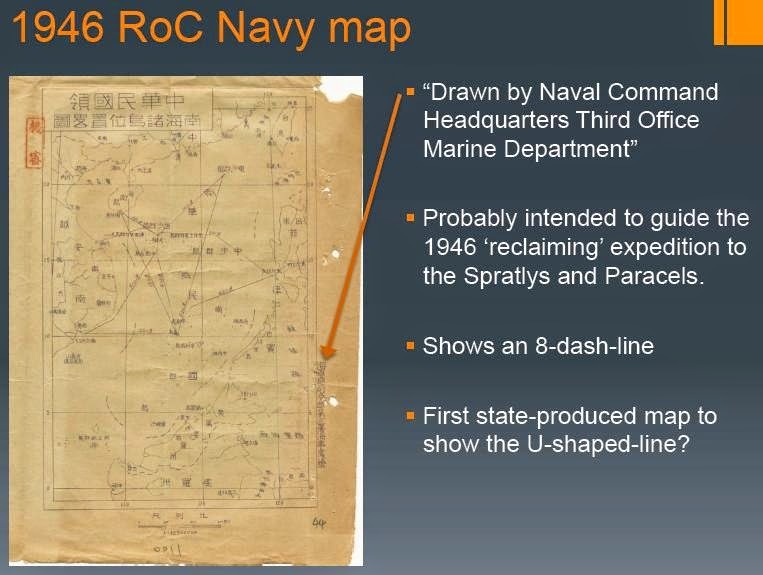 Check it though -- the Chinese got their maps of the Spratlys from the archives? Nope, they had to send to Manila. When a Chinese government committee first gave Chinese names to the islands in 1935 all it did was either translate or transliterate the existing British names. 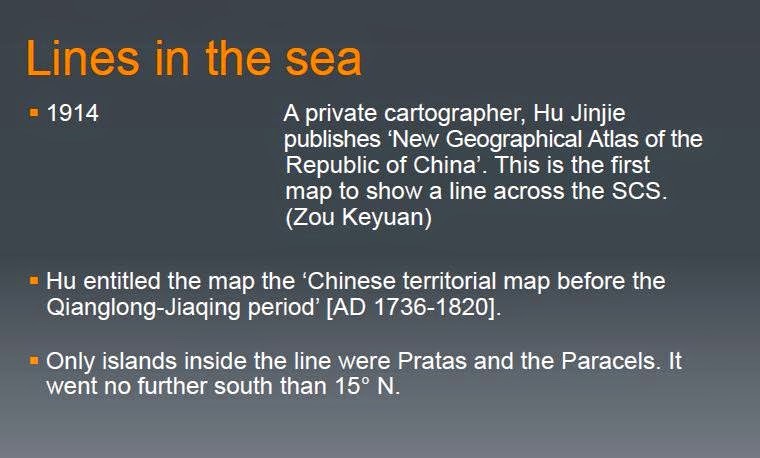 In the Paracels, for example, Antelope Reef became Líng yang (the Chinese word for antelope) and in the Spratlys, North Danger Reef became Bei xian (Chinese for “north danger”), Spratly Island became Si-ba-la-tuo (the Chinese transliteration of the English name). 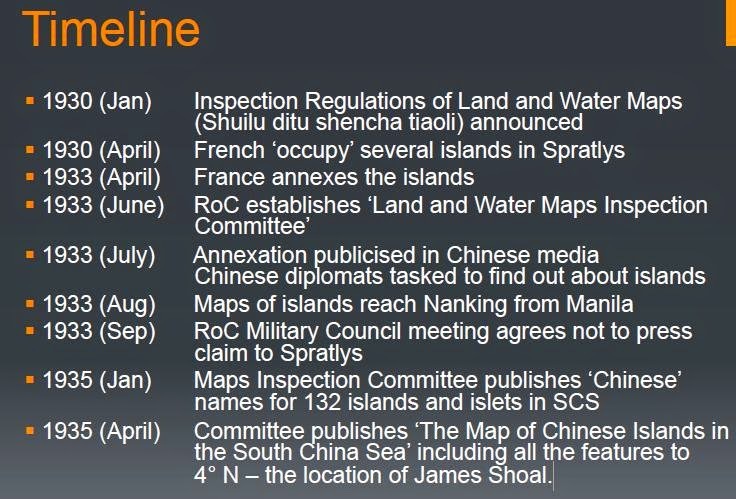 The Chinese committee simply copied the British maps, errors and all. The names were then revised, twice. Scarborough Shoal, named after a British ship in 1748, was originally transliterated as Si ge ba luo in 1935, renamed Min’zhu Jiao—Democracy Reef by the nationalist Republic of China in 1947 and then given the less politically-sensitive name of Huangyan (Yellow Rock) by the communist People’s Republic of China in 1983. The "traditional" names actually turn out to be names based on British names! 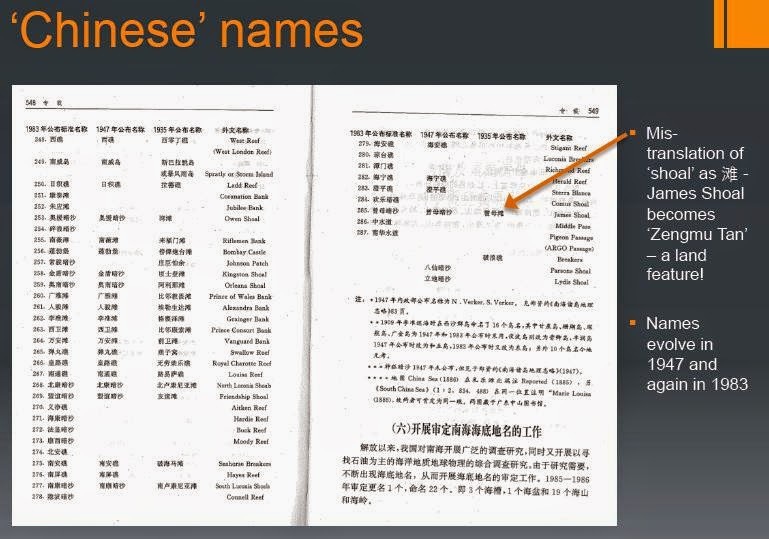 British/Western names were used because it appears there were no Chinese names for them. The names also shift over time. 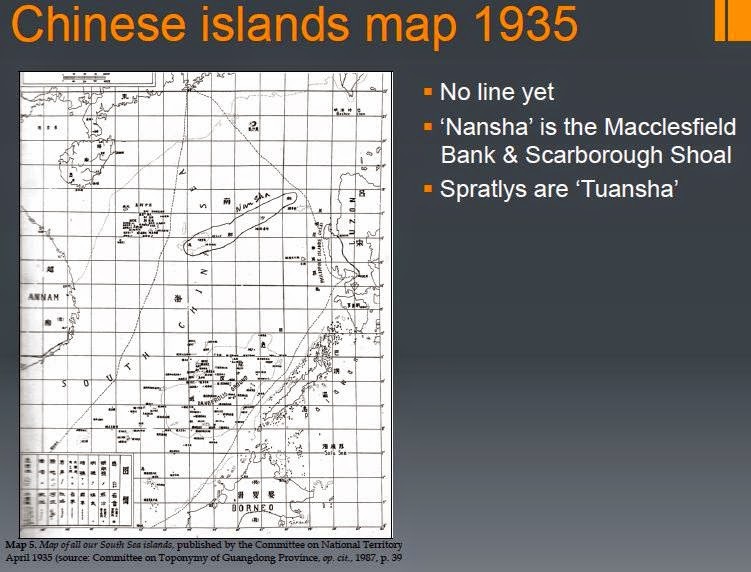 Nansha originally referred to another set of features; it now is used to refer to the Spratlys. 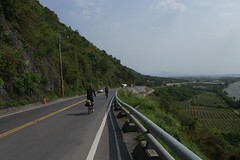 ...this one also includes Vietnam and Laos. Today the Chinese are busy turning Laos into a protectorate. Like the 1938 map above, this one shows the Sulu islands which are now part of Philippines and a good chunk of Russia, Pakistan, and sundry other nations as part of China, but not North Borneo -- evidently the cartographer hadn't got the memo on that one. One wonders when China will begin moving on the central Asia states and declaring their peoples to be "Chinese" like the poor Uyghurs. 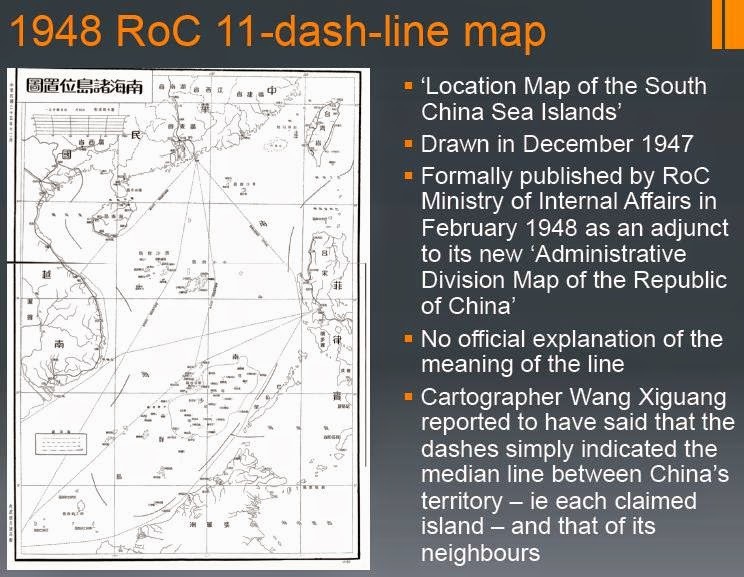 Bai Meichu's line around the South China Sea then appears on this 1946 ROC map, apparently the first official use. In 1947-48 the 11 dash line appears. One problem with the 9/11 dash maps is at the extreme southern end -- where do you connect the dots? If the line bulges out, it includes the Natunas Islands of Indonesia. 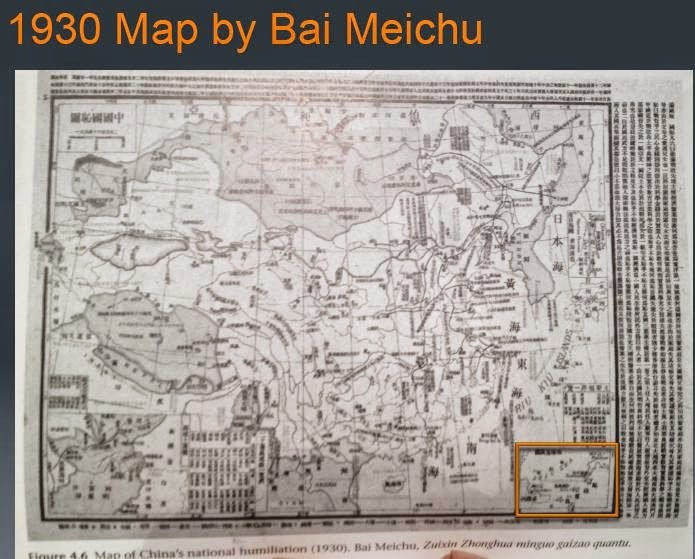 Which appeared on Chinese maps as Chinese in the 1990s. 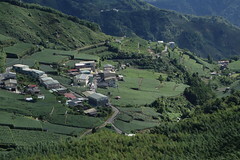 Interestingly, the main island used to be heavily populated by ethnic Chinese, but the Indonesia government moved in thousands of non-Chinese into the islands. It is now upgrading their defenses. The Diplomat and The National Interest on China's interest in the Natunas. Hayton's conclusions... note how this mapping of humiliation was a push by a small group of private sector expansionists that got picked up by the government in the 1930s, especially the latter half of that decade. That is why Taiwan isn't presented on official maps and texts as "Chinese" and treated officially as a lost territory until after the latter half of the 1930s. 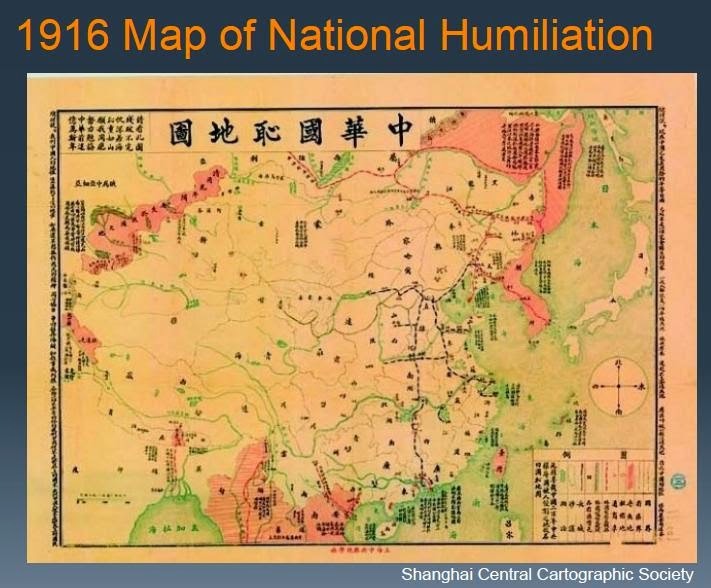 The moral is clear: if you analyze Chinese history in terms of the idea of national humiliation, you're forwarding Chinese expansionist propaganda. Note: the Wikipedia page on the Spratlys is awful and often simply regurgitates modern Chinese claims about history without any fact checking. For example, it says the 1887 Chinese-Vietnamese Boundary Convention defined the Spratlys and the Paracels as Chinese, but in fact it does not. Nope, sure doesn't. This is excellent, thank you. Only now is it sinking in for me that the "humiliation" the West imposed on China was no worse than what China has subjected Tibet, Uighurstan, and the Yunnan tribes to. Thus the outrage requires the basis of Han chauvinism, the idea that such things can be done to barbarian peoples, but to submit the Han to them is unthinkable. Well sure. But while we should be careful not to just blindly accept the prevalent Chinese view of China's history, we also shouldn't deny that first the Europeans and then the Japanese encroached upon China and, especially in the case of the Japanese, committed horrible atrocities there. Of course the Chinese have to be reminded that other countries were also colonized by Europeans and then invaded by the Japanese. What happened to China is really nothing that special. This is something many Chinese (I'm not sure about the Taiwanese) have probably never considered. """"ry, we also shouldn't deny that first the Europeans and then the Japanese encroached upon China and, especially in the case of the Japanese, committed horrible atrocities there."""" The Europeans got tiny pieces of the Manchu empire. China remained *almost* entirely intact and uninvaded, its religions and cultures unaffected. What happened to China is not special, except that it was mild in comparison to the Middle East, India, Africa, and the Americas. 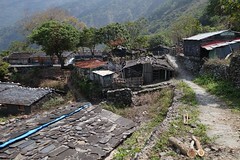 What China has done to the peoples in and around China is the same as what the Europeans did in their colonies. Just as brutal, too. Thanks! I'll work up something for this weekend. 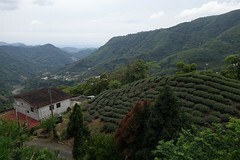 178Michael T you are truly a national treasure (of the nation of Taiwan I mean)! Thanks for the wonderful maps of national humiliation, er, expansion ! Awesome post! I'm linking it where I can so others can read the truth about the South China Sea Dispute origins.